Netanyahu orders Ministerial Committee not to discuss two bills calling for recognition of Armenian genocide. Prime Minister Binyamin Netanyahu has ordered the Ministerial Committee on Legislation to remove from its agenda two bills calling to recognize the Armenian genocide, Hadashot TV reported on Saturday. 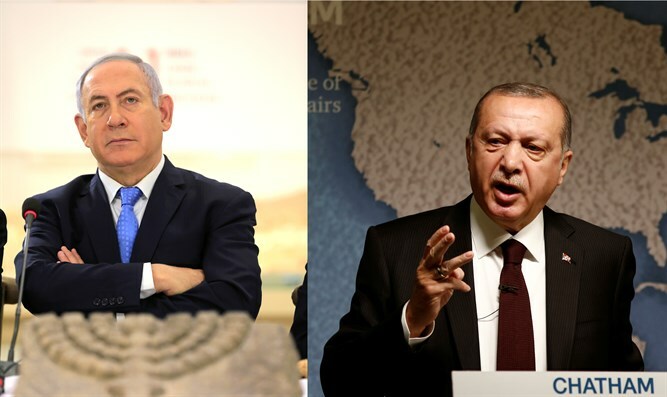 According Saturday’s report, two bills on the issue were submitted by MKs Amir Ohana (Likud) and Itzik Shmuli (Zionist Union) in the wake of the recent crisis in relations with Turkey. However, the initiatives will be shelved after Netanyahu asked that the the campaign against the Turks not be escalated. Armenians have long sought international recognition for the 1915-1917 killings in the Ottoman era as genocide, which they say left some 1.5 million of their people dead. Turkey -- the Ottoman Empire's successor state -- strongly rejects that the massacres, imprisonment and forced deportation of Armenians from 1915 amounted to a genocide. The bills were submitted amid rising tensions between Turkey and Israel in the wake of the violent riots along the Gaza border. Turkish president Recep Tayyip Erdogan has upped his anti-Israel rhetoric in recent weeks following the deaths of Gazans in the riots. Erdogan accused Prime Minister Binyamin Netanyahu of having blood on his hands. Erdogan later insisted that Hamas is not a terrorist organization. "What would we say if the world refused to recognize the Holocaust because of diplomatic discomfort and economic interests? If we share the denial of tragedies in history, we can never prevent those that may come in the future. I call on the government to leave political considerations aside and make the necessary historical justice," added Shmuli. “If the government is afraid to bring up the law, then we will bring it for a vote as soon as possible. I call on all the members of the coalition who have made it clear that it is time to recognize the Armenian genocide to pass the law together with us," added Lapid.